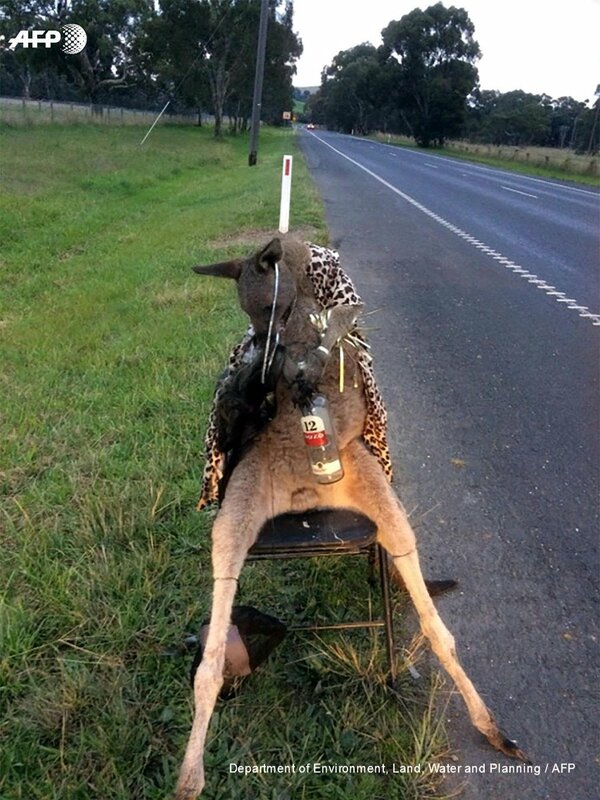 Authorities in Australia launched an investigation into a “tasteless” stunt that left a dead kangaroo dressed in a leopard costume and tied to a chair with a bottle of alcohol in its hands. A passersby found the kangaroo shot to death in Melbourne last month, the BBC reported. A bottle of Ouzo, an anise-flavored liquor, was tied to its hands. Authorities released the disturbing photo of the kangaroo this week, hoping someone will come forward with information. “This is appalling and immoral behaviour and we are urging anyone with information to come forward,” said spokesman Mike Sverns, spokesman for the Victoria’s Department of Environment, Land, Water and Planning, told the BBC. “It would have taken some time to stage the kangaroo in that position on the side of the road and we are certain that someone would have seen something, given the public area and traffic flow of this main road,” Sverns added. In Australia, people could face up to $27,700 fine or up to two years in jail for killing protected wildlife. About 34.3 million kangaroos are currently found in Australia.